Has it been tough for you to focus on moving forward? Are you searching for a connection to ancient, esoteric wisdom? Do you need help staying grounded? Snake as a Spirit, Totem, and Power Animal can help! Snake teaches you how to get in touch with the Earth Mother and to see things anew. Delve deeply in Snake symbolism and meaning to find out how this animal spirit guide can inspire, illuminate, and move you. The idea of Snake Spirit slithering into your life may not, at first, seem appealing. Many people have an aversion or fear of Snakes. Nonetheless, the ancients around the world thought of Snake as a symbol of life, change and longevity. It is not unusual for folks to seek out Snake symbolism and meaning when you need to heal or transform your life in some manner that improves the overall quality of living. Think of Greek tales of Asclepius, the God of medicine. His power tool is a staff with two Snakes entwined (the Caduceus). If you’re working on becoming a Light Healer (for people, animals or the earth) this is an excellent symbol to embrace for honoring Snake. Because the Snake moves along the ground, many connect this creature to the Earth’s most primal energy and the force of creation itself. Additionally the Earth element aspect of Snake reminds us to keep one foot on the ground even when exploring Spiritual pursuits. There are underlying themes in Snake Symbolism and Meaning and one is definitely personal growth. Snakes shed their skin as they grow, so ask yourself – what do you need to shake off so you can expand your horizons. Snake speaks heavily of old, outmoded ways of thinking and living that will hold you back until you’re ready for release. Once you do, the Snake’s metamorphosis process can begin within and without. The only caution is that the way in which you use your time and energy matters in this journey. Apply yourself to noble aspirations that provide balance and substance, and raise vibrational frequencies in your aura. 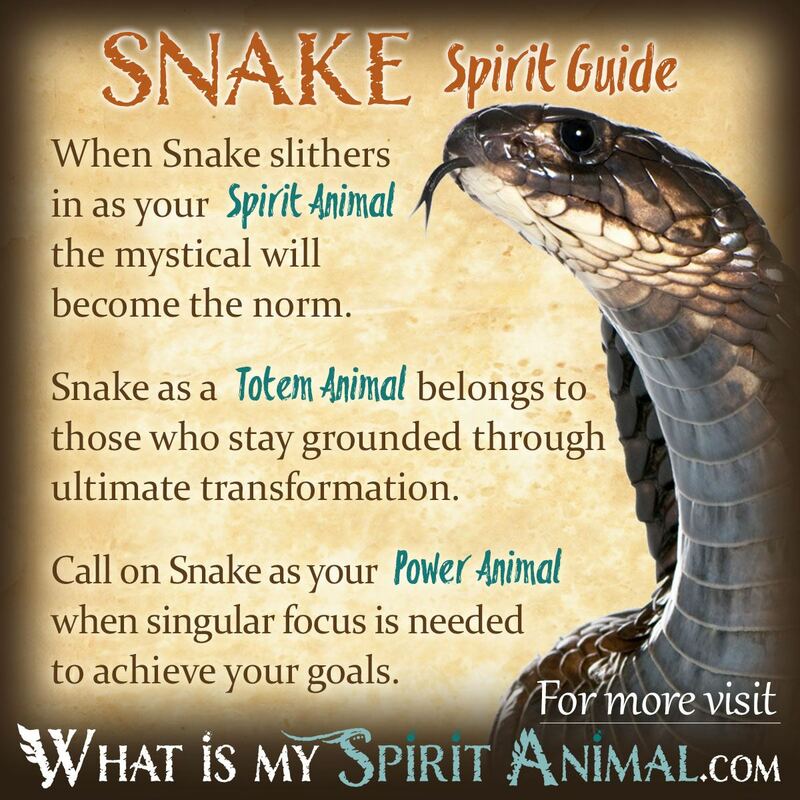 Snake Spirit is also a guide for Spiritual renewal. If you’re thinking of taking a new path but hesitate, Snake supports your efforts. Snake may also warn of moving too fast into something that may not be right for you. Move slowly. In nature, the Snake’s tongue is one of the most developed sensory organs. It gathers a great deal of information quickly so Snake stays out of harm’s way. Let that refined sense of “smell” direct you toward the best choice. When Snake starts appearing as a Spirit Animal and Guide it is time to cast away illusions, unhealthy beliefs and unreasonable expectations be they emotional, physical or Spiritual. The only way to wholeness is by walking in truth and living each moment to its fullness. Give up the “would haves”, “could haves” and “should haves” and focus on NOW. Several cultures including Celtic, Indian and Ancient Greeks felt the Snake embodied sexuality. It’s not surprising then that Snake Spirit may come to help you when you struggle with your passions and pleasures, and experiencing them wisely, without guilt. The Snake opens Chakras, particularly the Base Chakra so you can understand and embrace sacred sensuality in body and Spirit. This path to energetic opening is referred to as a “Kundalini Awakening”. One of the most potent lessons from Snake Spirit is that of the cycle of life, death and rebirth. Note this may not be literal (situations, relationships etc. have these elements). No matter the circumstance, let Snake guide you through this mystery. Keep a journal of your journey toward transformation. Always remember, though, Snake sheds their entire skin, they re-emerge whole. Snake Spirit can help you glide gracefully through even the most harrowing experiences. Snakes are terrifying to most folks. But why? Surely a ferocious, hungry Tiger pouncing on you or angry Scorpion hidden in your shoe is more likely to do damage, right? Snakes are primordial creatures and, so, stir ancient memories housed in our DNA. Snake energy causes us to consider life and death matters. This can rock your world. When Snake slithers in as your Spirit Animal, things are about to get really “real”. Don’t be afraid. Snake medicine can help you. People born with a Snake Totem are constantly changing themselves or circumstances around them. In between those efforts they’re typically content to bask in the sunshine of life! The only time they strike out is when startled or feel they (or someone they know) is in danger. With Snake as your Totem Animal, it’s vital you stay close to the earth. You may find yourself gardening, rock hunting or walking through the green forest with all your senses open. This is the perfect time to connect with your Higher Self, Devas, Angels and the Divine. These are all fantastic locations for healing meditations and honing your natural skills. If Snake is your Totem, you can really hold a group’s attention with your charisma and poise. Like the Snake you are flexible and able to shift your path both verbally and physically as situations dictate. When you choose Snake as your Totem Animal, messages from other worlds can become clear to you as each of your 6 senses become more finely attuned and powerful. Shamans and Light workers often see Snake as a guide for Astral Travel and trance work. If you are considering exploring out of body experiences, Snake is a powerful ally. Snake can also guide you in other realms so your Spirit doesn’t stray. Just remember that when you open yourself to Snake you are also opening yourself to changes that eventually manifest in Spiritual renewal. These changes are not always simple or without pain, but once confronted true healing begins. Snake Spirit has divergent symbolism in Native American tribes ranging from a huge monster that swallowed people in one gulp to the far more positive meaning of fertility (Pueblos) and rebirth (Ojibwa). One story from the Hopi tribe tells us of a winged Snake that communicates with the Earth Element. To honor this Spirit they have an annual dance that offers Snakes to the serpent, making prayers for the health and well-being of the tribe. Here and in several other North American tribes, Sneak is a rain-bringer. In Aztec tradition various Gods and Goddesses have Snake forms. This includes Quetzalcoatl, the great feathered Serpent. Quetzalcoatl was the God of the evening star who gave books, corn, and the calendar to humankind. The Celts were a Shamanic culture who studied animals as few cultures through history have and Snakes were among their favorite animal symbols. We see this in their elaborate Celtic Knotwork, their myths and legends, etc. Snakes represented graceful travel over any terrain, transformative healing, and a deep connection to the underworld as well as the heavens. Snakes behavior helped teach the ancient Celts how to live in synch with nature and, in particular, the seasons. Because a Snake’s eyes “glaze over” as they shed their skin, the Celtic Snake has become a symbol of altered states and it is believed that while in that state Snakes are tapping into all the knowledge there ever has been or will ever be. Snakes in dreams often deal with our subconscious mind that houses a lot of dynamic information that we often hide from ourselves. During your dream Snake may reveal issues or struggles that you’ve overlooked and need to see in the light of day in order to move forward. There are other meanings for Snake in dreams that are more situational – like being bitten, which could mean you’re exposing yourself to a toxic situation. Learn more about Snake Spirit by reading What Does It Mean When You Dream About Snakes? on WhatIsMySpiritAnimal.com! In the Chinese Animal Zodiac, Snake is like a little brother or cousin to the Dragon. It symbolizes working with herbs, insightfulness, and shrewdness. When the Spring festival arrives it’s not uncommon to see a Snake around a rabbit on people’s home and business as a charm for prosperity. People born under the sign of the Snake have charm, wisdom and clever tongues. If this is your sign you are likely good with finances, have a keen empathy for others and a serious drive for success. On the down side Snake people can prove jealous, distrustful and a tad overbearing. Snake people do well in positions where they use their keen minds for problem solving or philosophy. It’s been 5 days since I had this dream about a green snake which was in my bathroom and I am trying to put it in a container filled with water and putting a lid on it. In my dream I am not afraid of the snake biting me rather I am afraid that it might hurt my family, so I have to get rid of it. And when I tried putting on the lid the snake turned black. I don’t know it was a cobra or something but at that time I was focused on getting it away from my family. And then I woke up. I have been having these type of dreams since I was 6 years old. I have this fault in my kundli or something like that and I have been scared since then. I was 3 days ago and I meditated for my totem animal to show in a dream or in my life. And the next morning,I woke up and because it was my birthday,my dad got me a bag with a snake on it. And then,we went to visit a pagoda(I am from romania but we were in vienam in vacantion). And it was a man with a cobra. And when I saw the snake I felt that I should go at him. And the man put it on my shoulders. And I took a picture. After the picture,the snake,is slowly getting closer to my face and looked at me. And after everyone from my groupe took a picture with it. I saw that the snake got closer to my face just with me. And I thought:,,Hm…yep…maybe…it’s just a coincidence” and when we got back at the hotel,it was a big magazine with a snake on it. HELP! CAN THIS BE MY TOTEM ANIMAL?